When it comes to brand relevance, millennials and non-millennials have more in common than they think. In this post, I’ll do a deep dive into how U.S. millennials (18-37 years old) view brand relevance similarly and differently from non-millennials — and why brands like Spotify, Westin, and Target would register a relevance score almost twice as high among millennials than non-millennial customers. The data for this analysis comes from Prophet’s Brand Relevance Index™, published by Prophet (Altimeter’s parent company), which measures the relevance of top brands based on 50,000 consumer responses in four countries (U.S., Germany, UK, and China). To start, let’s take a quick look at the top 10 most relevant brands for millennials versus non-millennials (see Figure 1). While five brands make it to both lists, there are a few brands that are specifically millennial favorites, notably Spotify and PlayStation. 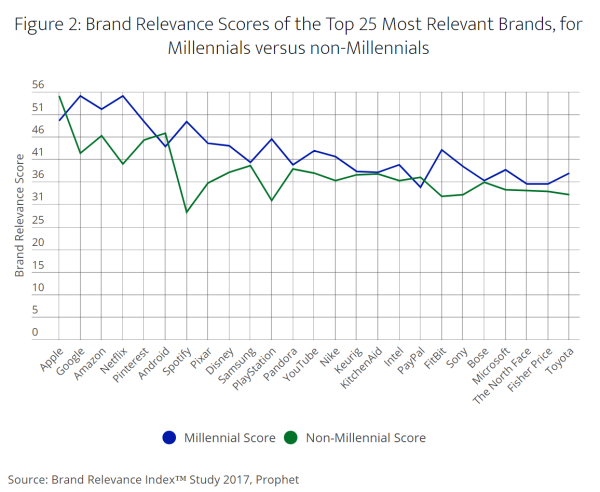 But also note the Brand Relevance Index (BRI) scores for millennials versus non-millennials — to be a top 10 brand for millennials, brands needed a BRI score of at least 43.68 compared to 37.59 for non-millennials. This makes it much more competitive to be a top relevant brand for millennials — you have to do better across all elements of relevance. I also did another cut of the data, looking at the top 25 ranked brands and how they fared with millennials versus non-millennials (see Figure 2). Again, there were some brands obviously positioned toward millennials that ranked much higher with this group. But it struck me that the raw relevance scores for millennials were consistently higher than the scores for non-millennials. Only two brands (Android and PayPal) had a higher relevance score among non-millennials versus millennials. To be among the top 25 most relevant brands, you had to be highly relevant to millennials. You don’t need to be a “millennial” brand to benefit from understanding how your brand is relevant to them. As we saw with this data, millennials are the very large canary in the coal mine – an early indicator for brands to gauge positive performance or identify potential problems/opportunities. Establishing relevance among fast-moving, tech-savvy millennials is vital in positioning brands for future growth – especially as this demographic moves into the mainstream. To dig deeper into what’s driving the difference, I looked into specific competitive pairings to see what some brands do to earn higher scores among millennials than their direct competition and to also understand what a brand can do to increase its relevance across the board by understanding how they stand with millennials. Although both music brands appear in the Top 50 and are close in ranking (Spotify at #7, Pandora at #12), how they got here says a great deal about each. Spotify’s relevance score among millennials is almost 2X higher than non-millennials, whereas Pandora’s relevance scores among the two groups are almost exactly the same (see Figure 3). In looking at the sub-scores across the four elements, Pandora is amazingly consistent across millennials and non-millennials, whereas Spotify does significantly better with millennials at the expense of being less relevant to non-millennials. The takeaway? Both audiences love their favorite music apps, but Spotify does a better job at identifying what millennials love, dragging along their older counterparts for the ride. Focusing on millennials is enough to tip the relevance scores slightly higher to make Spotify more relevant than Pandora. Marriott’s overall ranking at #81 is significantly better than Westin at #158. But for millennials, Westin comes in at #66 versus Marriott at #113. Looking at the sub-scores, Westin does far better across all categories for millennials than non-millennials (see Figure 4). For millennials, the two hotel chains have similar scores for Pragmatism and Inspiration. But Westin really pulls ahead in areas of Innovation and Customer Obsession, places where an emphasis on features and services appealing to tech-minded millennials really pay off. Westin would do well to understand where and how their brand resonates with millennials, especially around Pragmatic elements like “Delivers a consistent experience” to increase their relevance among non-millennials. Marriott should understand where it falls short on basics like being Pragmatic on the element “I can depend on” against a brand like Westin when it comes to serving millennials. Costco ranks overall at #45 versus Target at #82. Both brands have relevance scores that are higher with millennials than non-millennials, but Target’s relevance score with millennials is more than 2X its score with non-millennials. As a result, millennials rank Target at #20 versus #148 for non-millennials. Both Costco and Target would benefit from understanding what they are doing to serve the Pragmatic needs of millennials better than non-millennials — our data showed that two elements, “Makes my life easier” and “I know I can depend on” are the areas with the biggest gaps. Millennials have the set the relevance bar very high for all brands — not just brands that favor this demographic group. As millennials mature into the mainstream, it will be crucial for all brands to understand what millennials need, given their influence in determining a brand’s relevance.